Through the intersection of immediate and long-term infrastructure pressures, a number of locational-based risks exist in the GCR and are impacting the vulnerability of both communities and ecosystems in the city-region. These risks do not exist in isolation from the metabolic flows discussed above, but form part of the challenges facing the GCR. Some of these challenges are resultant of Mine Residue Areas (MRAs), Acid Mine Drainage (AMD) and flooding histories of the region. All of these factors are affected by climatic variability and global climate change, which is projected to result in small aggregate changes, and an increase in extreme weather related events, which will have broader implications for the city-region’s metabolism over time. Environmental risks are unevenly distributed across Gauteng, as are human settlements. The impact of environmental risk are arguably greatest when they are borne by communities living in poorly serviced, low income areas. This intersection is an important component of understanding the management and mitigation of environmental risk in the GCR. 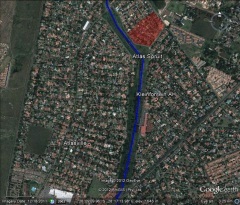 Highlighted areas in red indicates worst flooded houses in Atlasville (Google Earth). Stormwater culvert outlet into the Atlasville Spruit.. The legacy of apartheid planning coupled with urbanisation in the GCR has resulted in many people living in marginal and hazardous areas in the city-region, placing them at higher risk of disaster due to their location. In addition to this locational disadvantage, these areas tend to a large proportion of people living in these areas live in low income and informal housing. Ekurhuleni is situated on a relatively flat area of the GCR, which allows it to support a number of streams and wetland systems. Over time, urbanisation and industrial development in the municipality has led to formal and informal settlements, new and old, being built on flood-prone land. In response to flooding in Atlasville, which is a middle income suburb of Ekurhuleni, the community, together with environmental practitioners and the local ward councillor, united and lobbied for the municipality to address their flood problems. 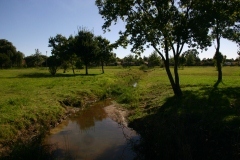 The municipality responded by increasing regular maintenance of the main waterway that runs through the area and by upgrading the major stormwater culvert. The upgraded culvert allows greater volumes of stormwater to flow through it and allows for water to drain into the spruit.